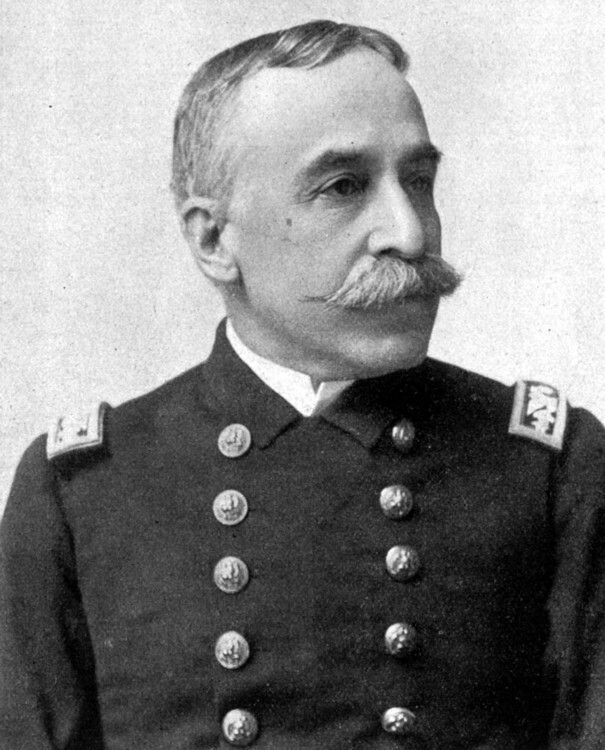 George Dewey, the only officer of the US Navy ever to hold the rank of Admiral of the Navy, was born on 26 December 1837, in Montpelier, Vermont. On 23 September 1854, he was appointed Acting Midshipman from the first Congressional District of Vermont, and upon graduation from the US Naval Academy in June 1858, was warranted Midshipman, to date from 11 June of that year. He became a Passed Midshipman on 19 January 1861, and on 28 February of the same year he was warranted Master. His subsequent advancement was as follows: Lieutenant, 19 April 1861; Lieutenant Commander, 3 March 1865; Commander, 13 April 1872; Captain, 27 September 1884; Commodore, 28 February 1896; Rear Admiral, 11 May 1898; Admiral, 2 March 1899; and Admiral of the Navy on 24 March 1903 to date from 2 March 1899. During the period 26 April 1861, until 30 August 1867, he had consecutive service on USS Mississippi, USS Brooklyn, USS Agawam, USS Colorado, USS Kearsarge, USS Canadiagua, and again USS Colorado. When detached from the latter he was directed to await orders of 1 October 1867, which returned him to the Naval Academy for a tour of duty which ended in September 1870. On 10 October 1870, he assumed command of USS Narragansett, and in February 1871 was transferred to command of USS Supply, hospital ship. 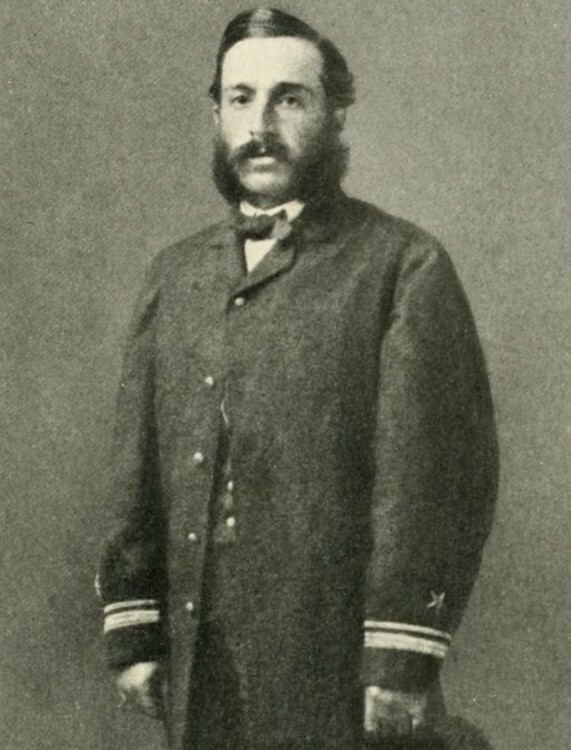 On 27 July 1871, he was ordered to the Navy Yard, Boston, Massachusetts, and after five months' duty there and brief instruction at the Naval Torpedo Station, Newport, Rhode Island, he again commanded Narragansett from 1 March 1873, to August 1875. Ordered on 25 August 1875, to report as Lighthouse Inspector, Second Naval District, at Headquarters in New York, New York, he served in that capacity until 1 August 1877, and as a member of the Lighthouse Board for eight months thereafter. On 1 May 1878, he became Secretary of the Lighthouse Board. On 18 October 1882, he was ordered to command USS Juniata, and remained at sea from 25 October that year until July 1884, when he was ordered detached and to the Navy Department, Washington DC. Again at sea, he commanded USS Dolphin from October 1884 until March 1885, when he transferred to command of USS Pensacola. 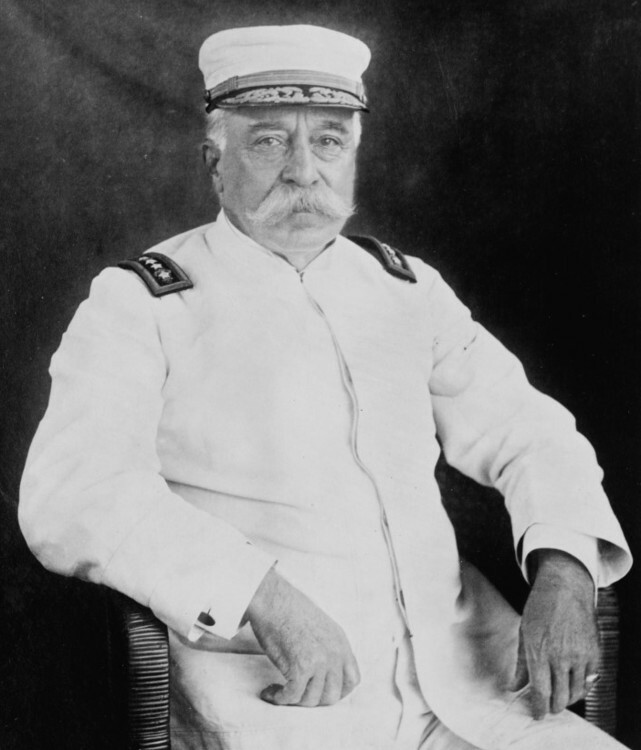 On 1 August 1889, he was commissioned Chief of the Bureau of Equipment, Navy Department, Washington DC. His term ended by resignation on 30 June 1893, when he again became a member of the Lighthouse Board. 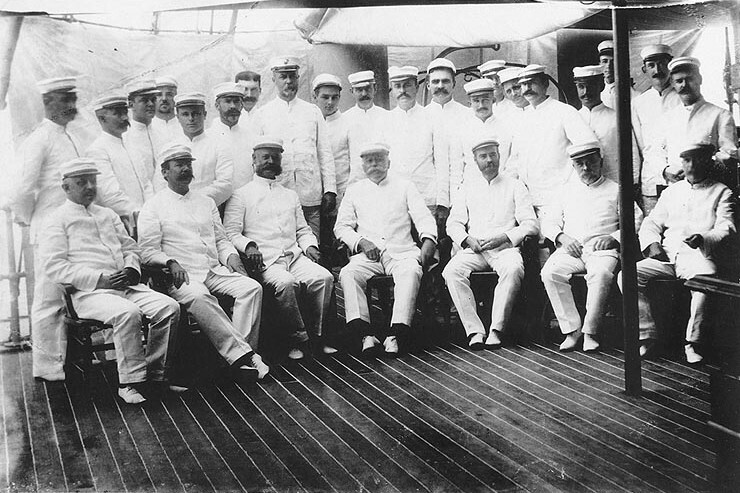 On 5 November 1895, he reported for duty as President of the Board of Inspection and Survey, Navy Department. 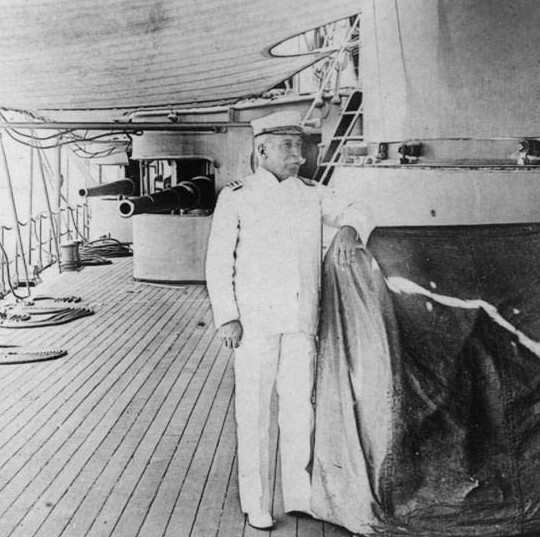 On 30 November 1897, he was ordered to Asiatic Station and, proceeding by steamer, he assumed command on 3 January 1898, his flag in the protected cruiser, USS Olympia, Captain Charles V. Gridley, commanding. The Spanish-American War action at Manila, Philippine Islands, 1 May 1898, not only gave birth to the historical expression "You may fire when you are ready Gridley," but also liquidated the Spanish Fleet and installations in the Manila Harbor without loss of men to the US Fleet. On 10 May 1898, Admiral (then Commodore) Dewey was given a vote of thanks by the Congress of the United States, and three days later was commissioned Rear Admiral, to date from 11 May 1898. That promotion was an advancement of one grade for "highly distinguished conduct in conflict with the enemy as displayed by him in the destruction of the Spanish Fleet and batteries in the harbor of Manila, Philippine Islands, May 1, 1898." 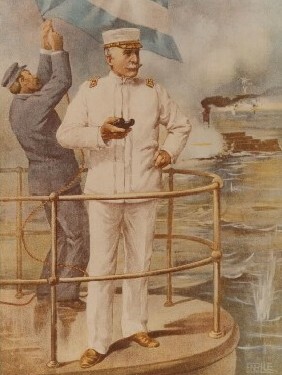 He was relieved of command of Asiatic Station on 4 October 1899, and ordered to the Navy Department, Washington, where on 29 March 1900, he was designated President of the General Board. 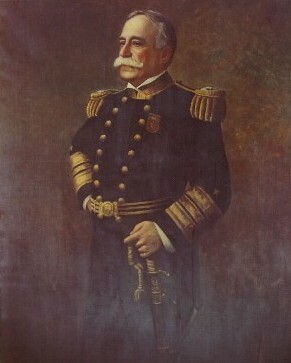 An Act of Congress, 2 March 1899, created the rank of Admiral of the Navy. It provided that when such office became vacant either by death or otherwise, the office would cease to exist. On 24 March 1903, Admiral Dewey, who held the rank of Admiral since 8 March 1899, was commissioned Admiral of the Navy, with date of rank 2 March 1899, and became the only officer of the United States Navy who was ever so commissioned. 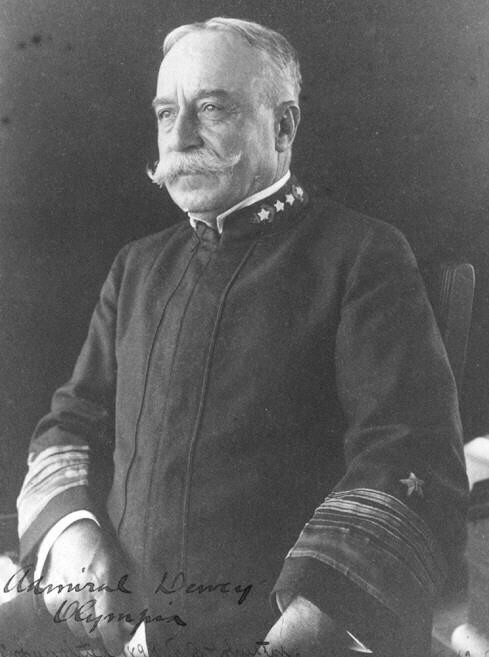 He held the rank of Admiral of the Navy until his death in Washington, DC, on 16 January 1917. The body of Admiral Dewey was interred in Arlington National Cemetery, Arlington, Virginia, on 20 January 1917. At the request of his widow, his remains were reinterred in the crypt of Bethlehem Chapel at the Protestant Episcopal Cathedral, Mount Saint Alban, Washington, DC, on 28 March 1925. Besides his widow, Mrs. Susan Goodwin Dewey, Admiral Dewey was survived by his only son, George Goodwin Dewey. Admiral Dewey earned the Civil War Medal; the Spanish Campaign Medal; the Philippine Campaign Medal; and the Dewey Medal (commemorating the Battle of Manila Bay). 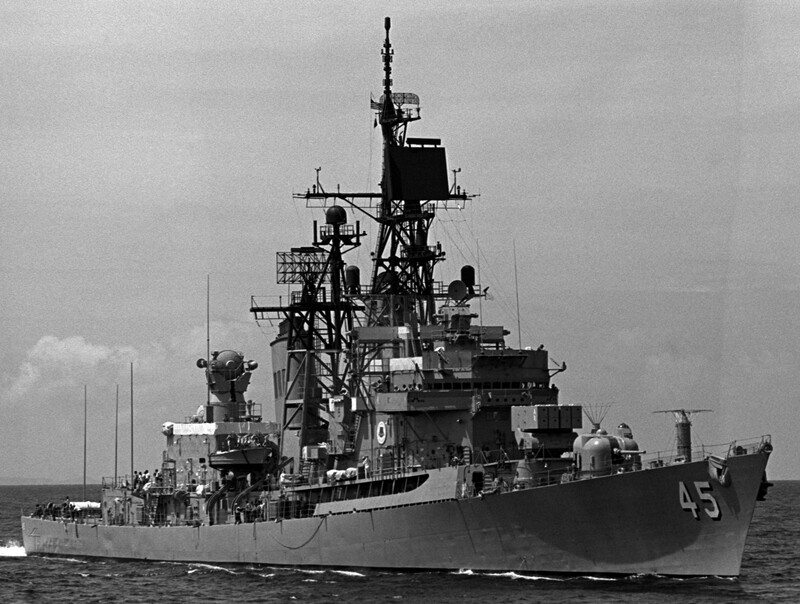 A destroyer, USS Dewey (DD-349), was named to honor Admiral of the Navy George Dewey. Built by the Bath Iron Works Corporation of Bath, Maine, she was launched on 28 July 1934, under the sponsorship of Miss Ann M. Dewey of Quechee, Vermont, great-grandniece of Admiral Dewey. 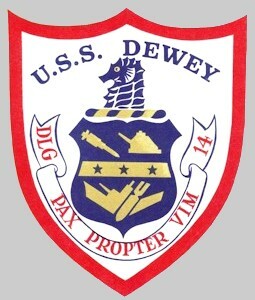 Dewey was placed in commission at the Boston Navy Yard on 4 October 1934, and earned thirteen battle stars for operations in the Pacific War Area during World War II. Meanwhile, Dewey had brought the Filipino insurgent Emilio Aguinaldo to Cavite in May hoping to learn more about the Spanish garrison and welcoming any distraction the Filipino rebels might provide by their operations against Spanish forces. However, Dewey and the American consuls in the Far East overestimated their ability to control the consequences of these actions, which included Aguinaldo's expectation that the United States would support his demand for the colony's independence. By the time American forces were prepared to assault Manila in August, the potential problems of cooperating with the rebels became apparent to Dewey and Merritt. The American commanders reached an oral agreement with the governor-general at Manila to surrender the city after a brief naval bombardment and infantry assault. On the morning of 13 August the guns from the U.S. squadron opened fire and Merritt's troops went forward. After sharp fighting in some quarters the Spanish surrendered, allowing the Americans to occupy Manila, keeping the Filipino insurgents out of most sections of the city. The peace protocol was signed between the United States and Spain on 12 August, but word of this did not reach Manila until four days later. USS Dewey (DL-14 / DLG-14 / DDG-45), the ninth Farragut class destroyer, was laid down 10 August 1957, by Bath Iron Works, Bath, Maine. She was launched 30 November 1958 and was commissioned 7 December 1959 with Commander Elmo R. Zumwalt, Jr. as the commanding officer. 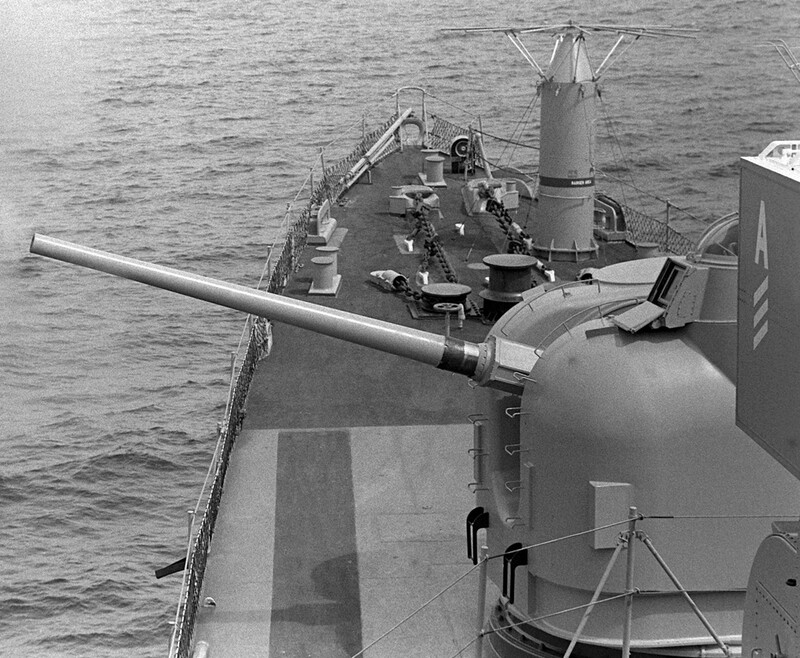 In early 1960 the USS Dewey engaged in training operations off the New England coast and in the Caribbean, preparing Dewey for her role in the Atlantic Fleet. 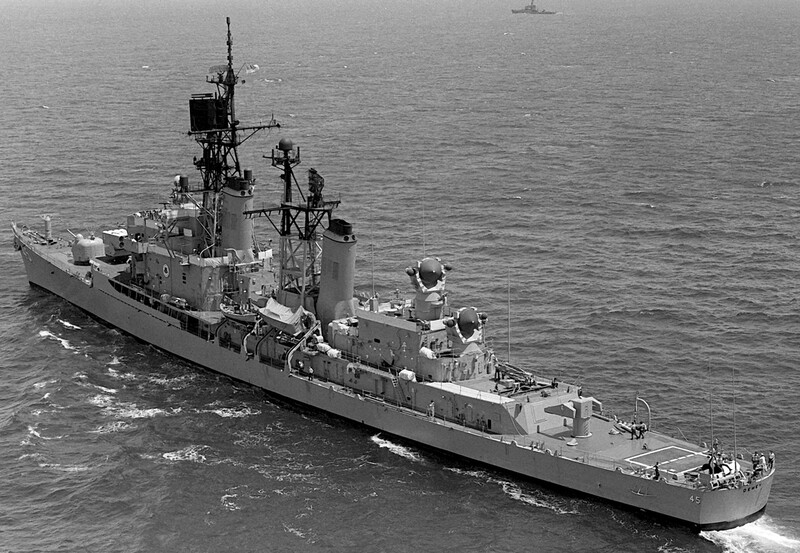 As a part of USS Dewey regular cycle of training and deployments she participated in the 1961 Northern Europe GoodWill tour. 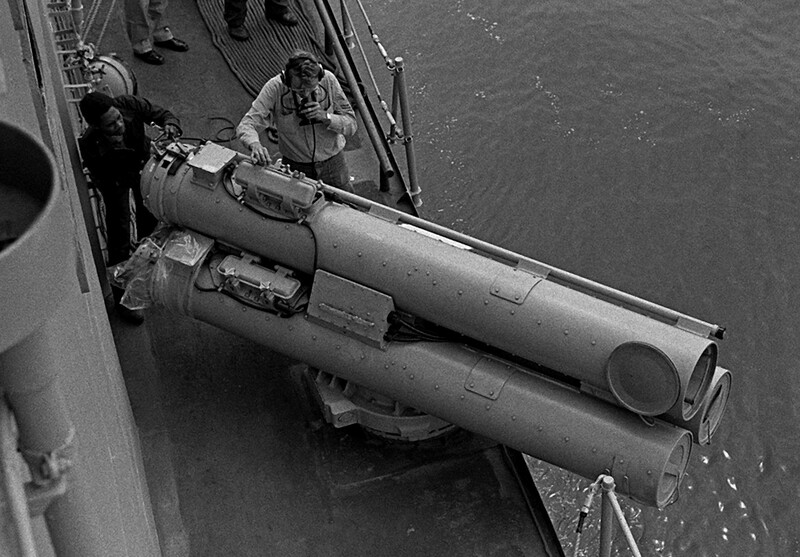 The next significant event was the 1962 Cuban Missile Blockade that Dewey played a part in. In 1965 Dewey cruised in the Mediterranean and in 1966 the Caribbean. 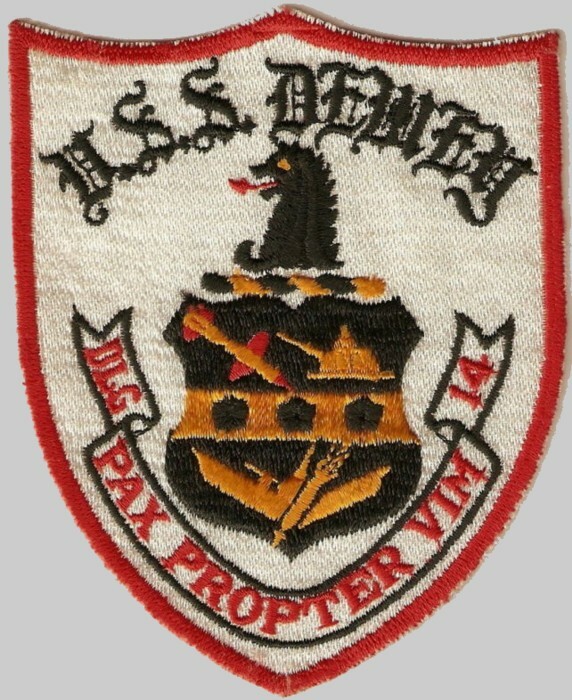 In 1967-1968 Dewey operated in the Pacific and did West Pac tours in support of operations in Viet Nam. 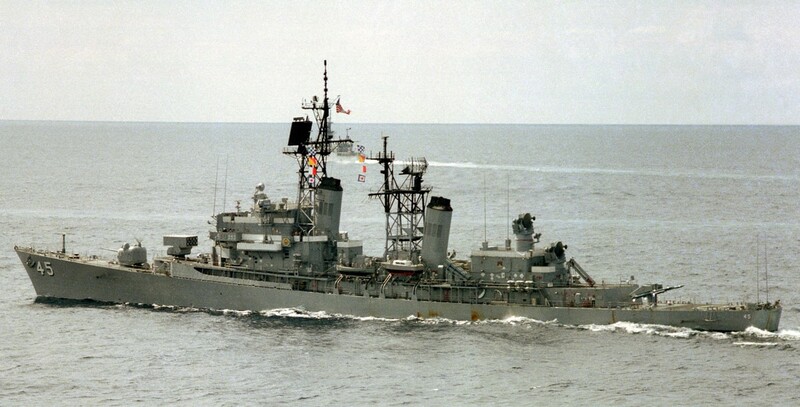 When the USS Pueblo was captured in North Korea, Dewey operated off Korean coasts for a number of months. Late in 1968 Dewey had a Blue Nose Line Crossing Ceremony when they passed through the Arctic Circle. 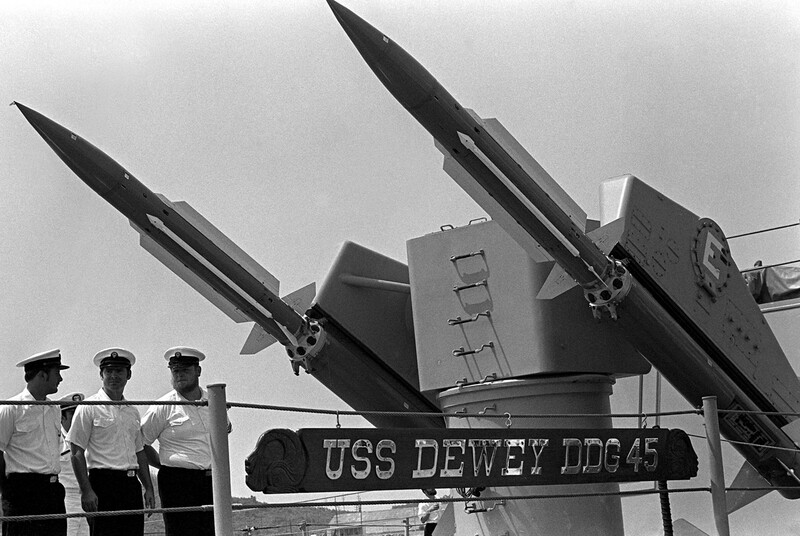 Dewey’s last deployment in 1969 was a North Atlantic/Med-Indian Ocean cruise. 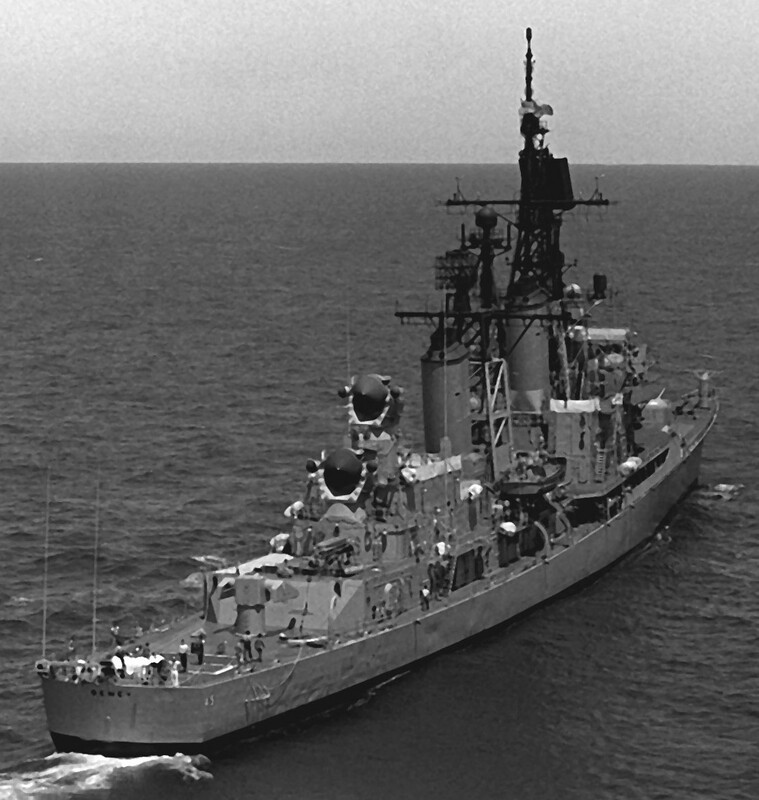 USS Dewey was decommissioned 21 November 1969. 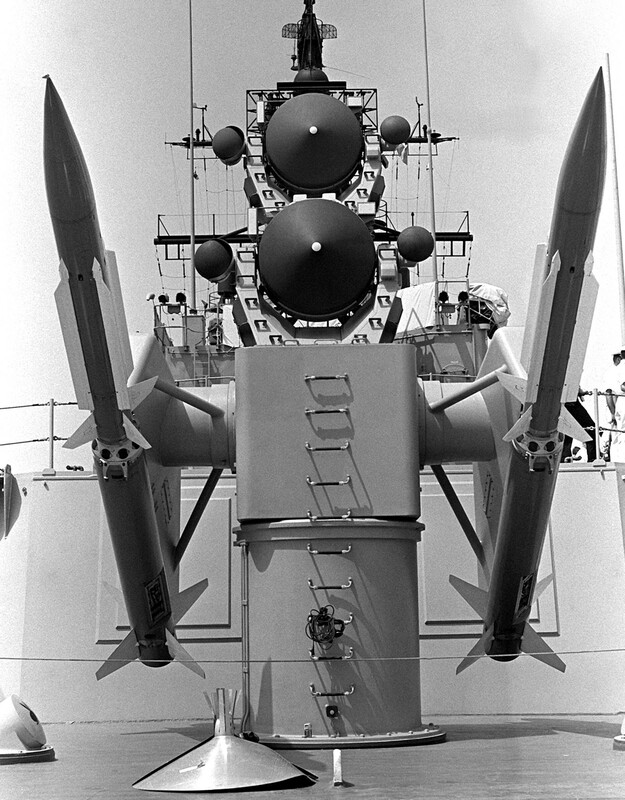 After an extensive conversion as part of the Navy's Anti-Air Warfare Modernization Program Dewey was recommissioned 31 March 1971 as a guided missile frigate, hull number DLG-14. 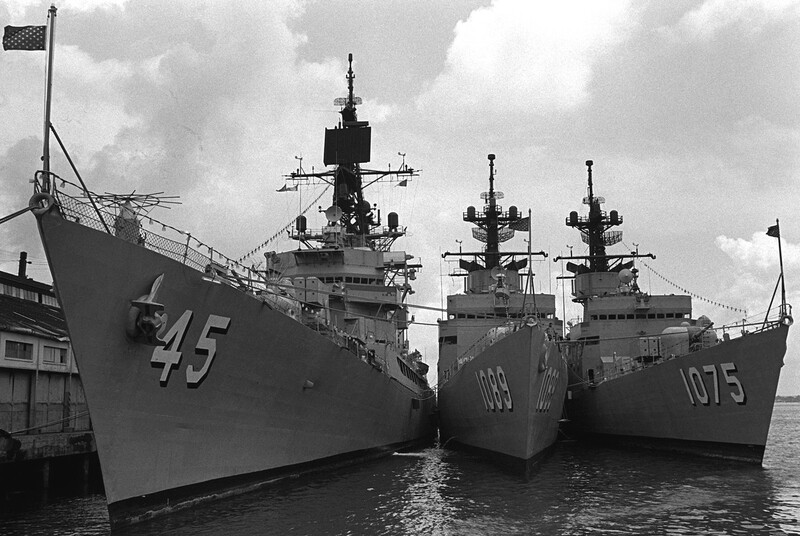 Back in service in 1972 Dewey had West Pac deployments supporting operations in Viet Nam. Accordingly Dewey had Shellback Initiation Ceremonies for crossing the equator in the Pacific Ocean and later that year in the Atlantic Ocean. 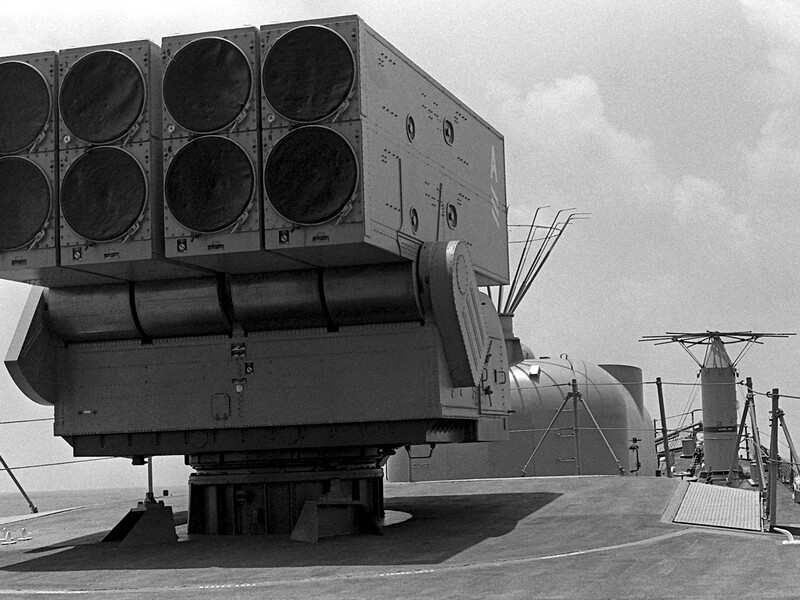 In late 1973/early 1974 Dewey was involved in the Yom Kippur Conflict and participated in a Radar picket at Crete. 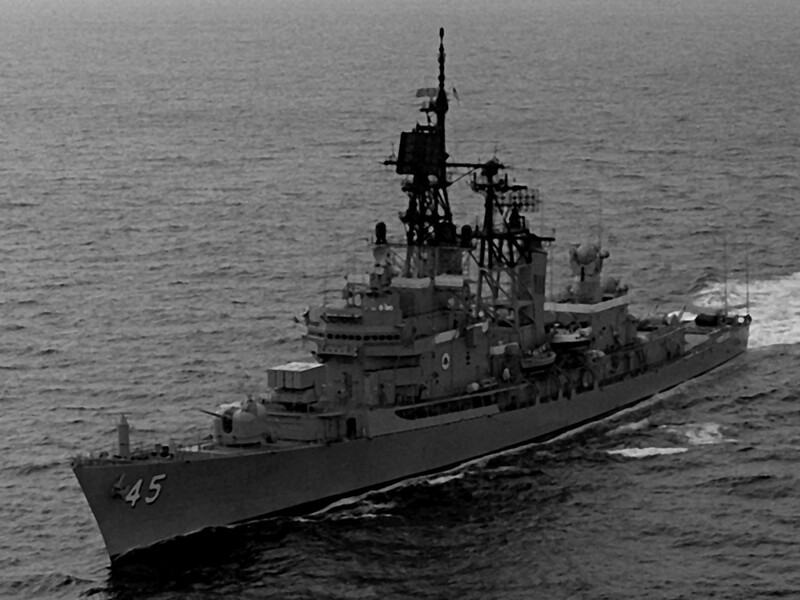 On 30 June 1975, the USS Dewey was refurbished and reclassified as a guided missile destroyer, receiving new hull number DDG-45. 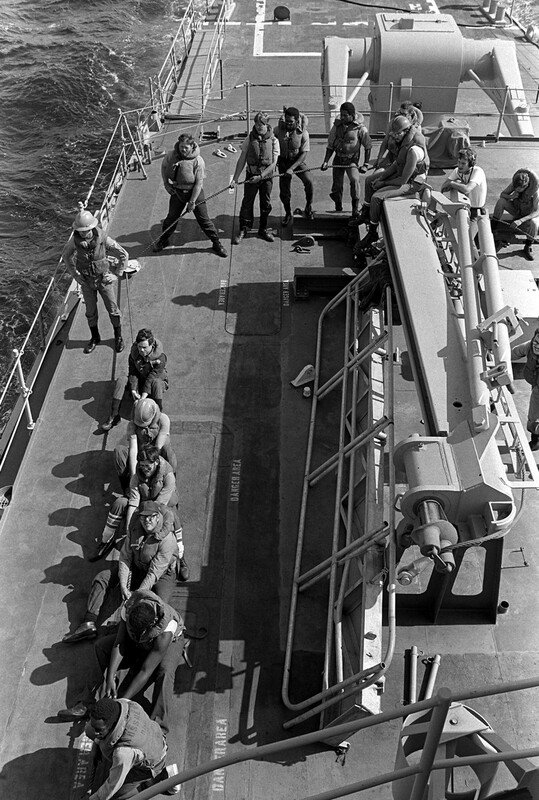 Dewey went on deployments to the Mediterranean and North Atlantic in 1977, the Mediterranean in 1978. 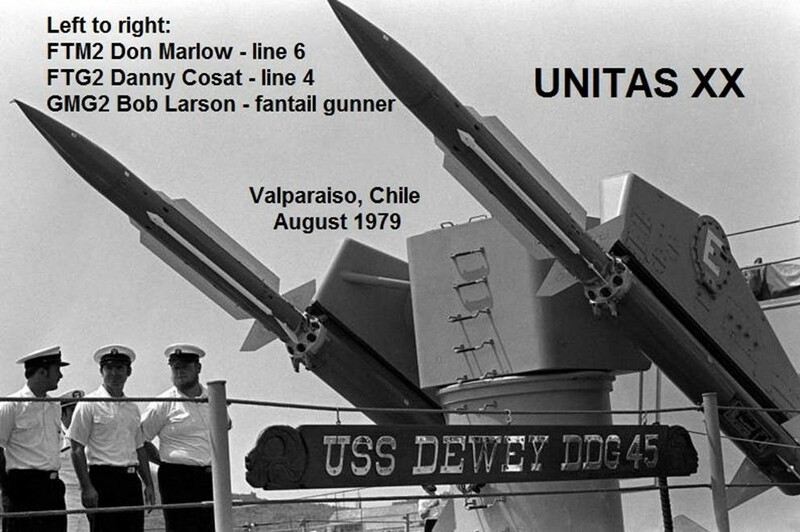 In 1979 Dewey participated in UNITAS, a training exercise that cultivates stronger ties, and increases interoperability with foreign allies. 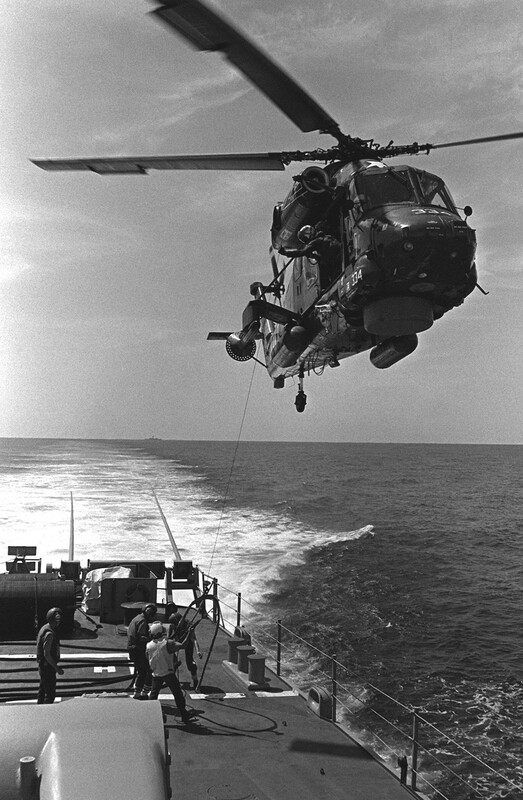 Dewey did a regular deployment to the Mediterranean in 1982, a Standing Naval Force Atlantic (STANAVFORLANT) evolution in 1983 and another Mediterranean deployment in 1985. 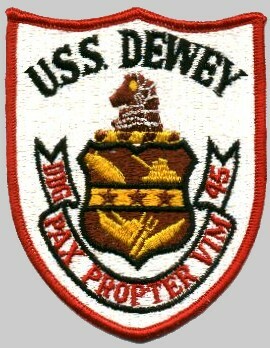 Dewey was decommissioned 31 August 1990 and struck from the Naval Vessel Register on 20 November 1992.